The Sloane planter was designed by Harry Butcher, master plasterer, renowned for his work in restoring the fine elaborate ceilings in the City of London after World War 2. The Sloane planters are designed in fibreglass to replicate wood, but without the problems associated with wooden plant pots. The planter features a white finish. It is available in five different sizes. 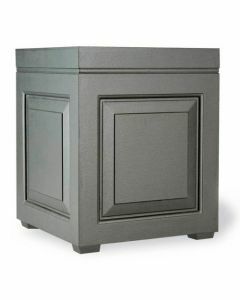 The small planter measures 11.8" Sq X 14.2"H, the medium measures 15" Sq X 18.1"H, the large planter measures 18.1" Sq X 20.5"H, the extra-large planter measures 24" Sq X 28.8"H and the XXL planter measures 31.1" Sq X 39"H. Please choose the size from the drop down menu. Click on image for greater detail.